Action: Shuffle One of the Thousand into its owner's deck to lower the cost of the next Shub-Niggurath character you play this phase by 1 (to a minimum of 1). Flavor Text: As she fell, another quickly took her place. I can't stand this card. Shub is really hurting for good 1 cost characters, and this girl isn't helping. Zero skill is bad enough, but then look at the ability. 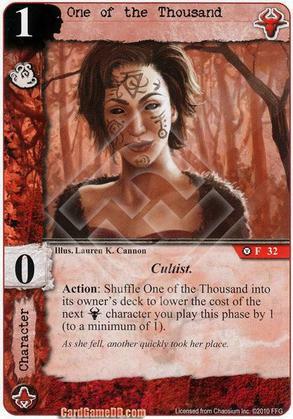 A one time reduction by 1, but then you have to shuffle her back into your deck, meaning late in the game when you need to draw something really good, you might just draw her again. I would've preferred sacrificing to pay for the ability. Even with the Terror icon, this card should cost zero. Then, it would've been at least palatable. Yep, pretty terrible. I can't imagine this appearing in a deck unless you already have 3 Priestess of Bubastis's and even then it is just too pitiful to justify including.